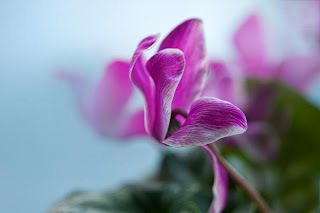 I did some indoor photography yesterday with cyclamen. Indoor work lets you sit down, change the colour of the sky, the amount of light, the position of the flowers. These are the portraits. Indoor cyclamen looks out to the blue winter sky, longing for the warm summer days outside. 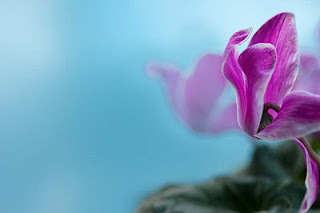 Indoor cyclamen sees the blue winter skies outdoors, filled with frost and snow. It feels alone and wonders if it will ever see Spring, despite the company of its Kin.